Our fairy arrived wrapped in pink tissue paper from which gold glitter floated down when it was ripped off. The girls thought it was wonderful and couldn’t wait to get her out of the box. She’s very pretty and the girls were eager to get her flying so we put in the batteries and sat her on the base to charge her up. It didn’t take too long and Kaycee was the first to try her out. You’re supposed to be able to control where she flies by placing your hand under her feet so she’s just hovering above it and moving your hand around. I’m sad to say that she didn’t have any luck at all in controlling her because as soon as she left the base she shot straight up to the ceiling. We tried getting her to start spinning then holding her by the head and placing her above our hands rather than letting her rise off of the base but that still didn’t work. Sorry about the angle…I’m better at taking photos than video! After various tries by Kaycee, me, her dad and Ella we gave up. I must admit, we had a lot of fun seeing her shoot up to the ceiling and trying to get her down but after a while the girls got frustrated with not being to make her do what she was supposed to. The girls did keep trying over the next couple of days but unfortunately, a little later in the week, Ella was playing with her in her room and somehow the metal piece in her foot that connects to the base to enable her to get charged up, fell out. We couldn’t find it so once her battery loses power we won’t be able to charge her anymore. 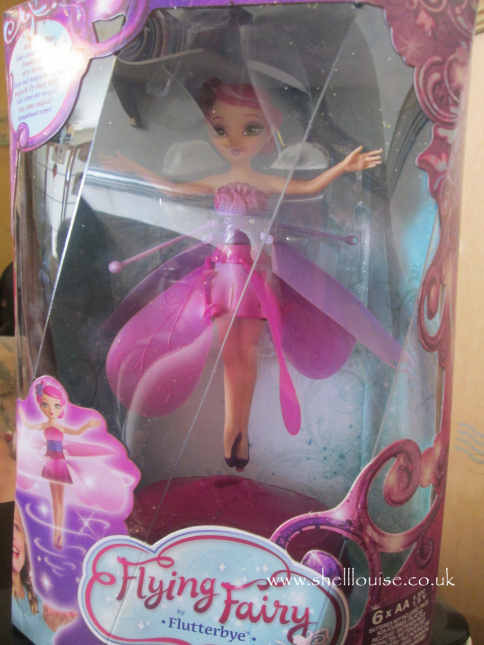 So all in all, we’ve not had a very good experience with Flying Fairy Flutterby and I’m not quite sure what to do with her once her power has gone. 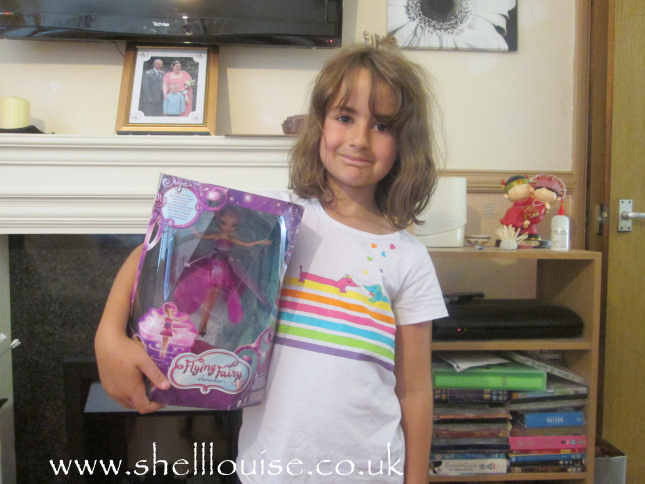 We were sent another doll to try and I’m very pleased to report that this fairy is very well behaved, unlike the first one! She doesn’t fly off to the ceiling straight away and stay there; she goes up but then comes back down a little and she’s not too fast to catch! We were also told to press the button on the base unit if she did go too high and that brought her back down a little again. I’d have probably found this out if I’d read the instructions properly! I’ve checked a lot of other reviews and I’ve come to the conclusion that we just got a naughty fairy who flew too fast and high because no one else seems to have the problems we’ve had. I’m sad to say our second fairy stopped working again. I’m not sure when exactly she stopped working; the girls hadn’t played with her for ages and when I saw the comments below, I asked them why they hadn’t played with her and was told she no longer works. The piece in her foot that allows her to be charged fell out and got lost. I’ve now thrown her away and won’t be bothering getting a new one. Please note: We were sent the doll to review and this is my honest and accurate opinion. Ours also. We got a newer version. No more batteries, but a USB plug and the same design base. We had a great time for about a week, then the same crash and hair tangling disappointment. This is the 2nd one we tried. My business will go elsewhere. Ours worked for 1 flight. Yes.. one flight. After that all it does is go straight up to the ceiling and stay there. I contacted customer Support, and they told me to *recalibrate* it. This supposedly involves letting it take off, and then immediately hitting the *shut down* button. This process should be repeated three times. I have repeated it several times (many sets of three, then sets of five.. and then sets of ten)… and no, it didn't help. It still just flies up to the cieling and stays there. I am *so displeased* that words can hardly express it. We've had ours for about 2 days and the wings spin but hit her arms and won't fly. My 6 year old is very upset as she spent her own money on this very expensive toy. Has anyone figured out how to fix it or why it's started doing this? Ours have died too. Same symptoms as the others. Wings move but no flight. My four year old is very sadden by this. After reading the reviews, I will not buy another fairy. This was a Christmas gift. Lasted two days. I'm really sorry I haven't replied to any of these comments; for some reason I haven't received any notifications of them being posted and only saw them now when I came to update the post again. We seem to be having the same problems also. Our fairy was working fantastic for 2 days. Now she won't leave the base! She doesn't seem to be spinning properly. Even if you lift her off the base she just falls to the floor. One very sad 6 year old. I bought one for my Granddaughter. 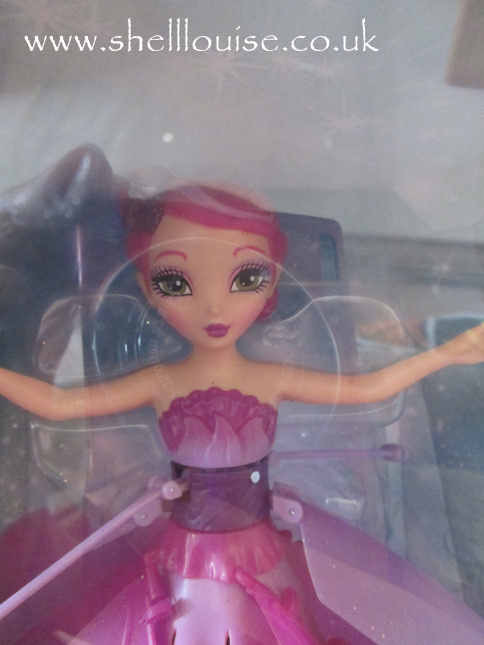 It has worked for a half of the day, and now I am having trouble getting her to do anything … The base says she is charged, but she will not fly … I am getting no response from her, and am very mad about the cheap0ness of the construction … It is too expensive for the lack of function she got from it. I bought my 9 yr old one and after we figured it out she was flying but now after waiting 30 minutes to be charged she doesn't fly from her base and won't fly no matter how many times we tried.I am sad to see my daughter upset because her fairy won't fly up. I got a four year old who is very upset that her fairy is doing the same high flying tricks.